Spring clean ups mean different things to different folks. For us in the Landscape (green) industry it means breathing life into our landscapes for another season of enjoyable beauty. 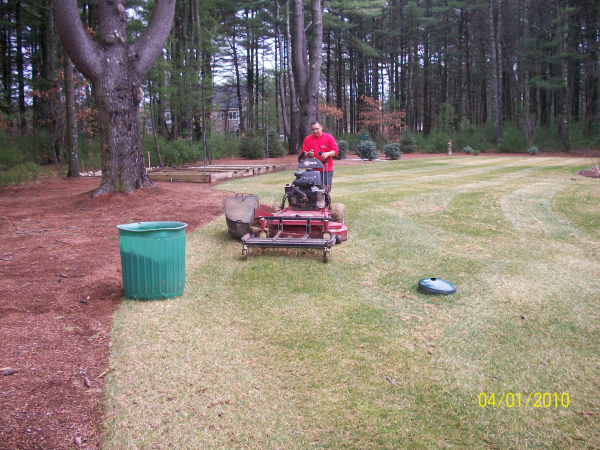 As the snow subsides and the early bulbs begin to dominate the landscape our crews are gearing up with rakes, pruners and a lot of energy to attack the matted grass, snow damage shrubs and depleted soils. Here are a few rejuvenation tips we do with our spring clean up customers. Evaluate and prune any broken or damaged branches that may have been compromised during the winter seasons snow load. Wait until the soil has dried and rake the lawns and loosen the matted grass to promote air movement and prevent disease (mold). Hand rake the gardens floors and cut back any dead stalks and address any of your spring pruning needs at this time. Fertilize the lawns and gardens with organic fertilizer to add nutrients / organic matter to the soil; as recommended by your soil test. Hand edge your gardens keeping them defined and preventing undesirables from migrating across the lines.